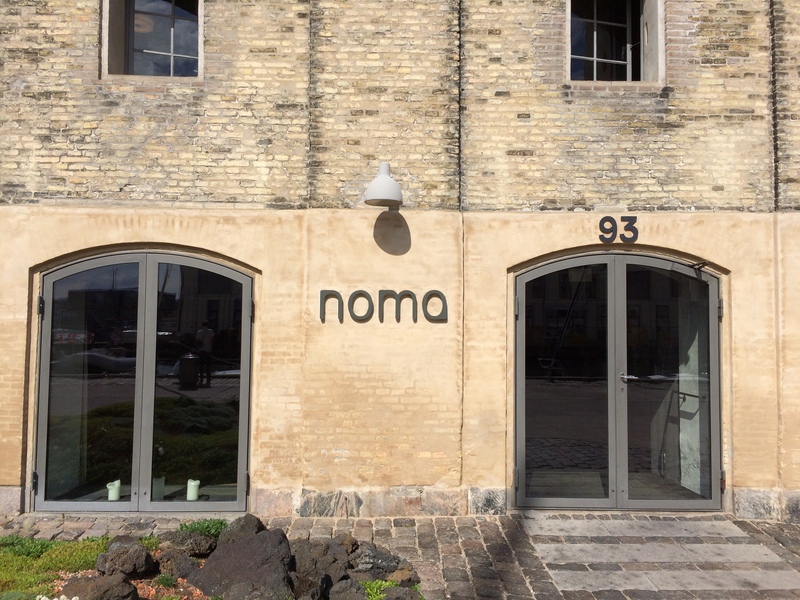 How does one blog about a visit to Copenhagen’s Noma, the “best restaurant in the world”? Do you focus on the food, the changing menu of everyday and very unusual ingredients put together in ways that, well, us regular people never would think to do? Do you focus on the wine, paired with the many courses from some of the most obscure and unusual wineries in Europe (only European wines!). Do you focus on the culture of Noma, which can be observed from the friendly greeting from EVERYONE as you enter, through the service of the exceptional and long meal, and via the tour of the premises that is offered after you finish eating? Do you focus on the price – not crazy expensive these days, but an investment nonetheless? I will attempt to do a bit of everything in this series of four posts, for my visit to Noma with Dorianne and two friends was, if nothing else, an event. It was more than the food, more than the wine, more than the service, more than the culture, more than the location. It was more in just about every sense of the word. It is over 24 hours after we left and I am still not feeling normal, physically, mentally or emotionally. How does a visit to a restaurant do that to someone? We began to plan our visit to Noma over six months ago. Imagine a 45 seat restaurant with a staff of 45 or more! With a food lab on the premises! That serves 18 or so courses of totally creative dishes! Much of which is foraged! With wine! We decided to go, but getting there was not without its complications and moments of fear. I researched several websites that were about Noma or about visits to Noma (LINK) (LINK) (LINK). I looked at Noma’s unassuming website (LINK) to find out how to get reservations. They put a month’s worth up at a time, about 3 months in advance. Since we wanted to come in July around the date of our tenth wedding anniversary, I discovered that we needed to be online on April 6th at 10:00 am Copenhagen time. We were in Spain at the time. I got online a bit late, about 10:10 am, and was informed that I was number 2499 and that there were 2278 people ahead of me waiting to be served. My waiting time would be about 90 minutes. I did not do the math of about 2 seatings a say of 45 people for 31 days, as some of those ahead of me would not be getting the dates they wanted, etc. About 70 minutes later, I was in. We had booked an apartment in Copenhagen for July 21-24, so I requested a table for four (another couple was going to join us on the trip) on the 23rd through the website (all automated). The response was that I was booked for lunch. Great! That was comparatively easy. A few days later as expected, I got an email from Noma requesting a credit card number (they have a policy that charges you if you change your reservation), and saying that they were looking forward to seeing us on APRIL 23RD!!! I called Noma to try to get this changed and eventually connected with the reservations director. She told me that I made the reservation for April 23rd via the website. I told her that I thought that only July reservations were available on that day. She told me that there were also cancellations available via the website (you heard that here first!). I told her that we would not be in Copenhagen until July, so was there a way to change the reservation? She checked and said that July 23rd was fully booked. I asked about July 22nd. She said that there was a spot for lunch for four. I said we would take it. Then I hung up and had a glass of wine. Then, in May, the couple who was going to go to Copenhagen and to Noma with us, cancelled. This put us in the position of either changing our reservation and paying the fine(!!) or finding someone else to go with us. We were in Barcelona when we go the news. What to do? The next evening in Barcelona, where we were attending and presenting at the Spirituality and Creativity in Management Congress 2015, at the Esade Graduate School, we went to dinner with some of the other attendees and presenters. There we met Ginger Grant, who just happened to be teaching at a graduate program in Copenhagen in July. Match made in heaven! Ginger agreed to come and bring someone to make a party of four. The Big Day came. 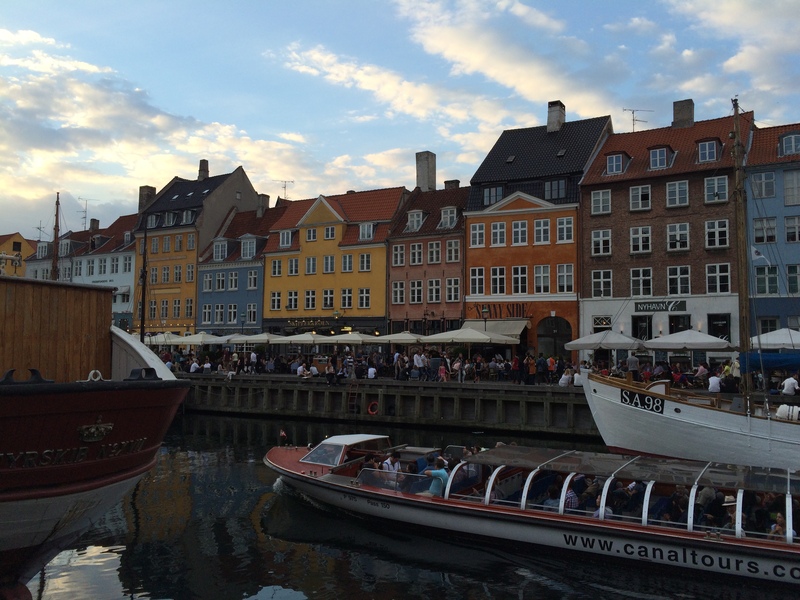 We arrived in Copenhagen in the evening on July 21st, had a quiet dinner on the Nyhavn canal, and turned in at our 5th floor walk-up AirBnB. Nyhavn Canal area in Copenhagen. At the appointed hour on July 22nd, we walked the kilometer or so to Noma, met our dining companions outside. A Noma staff member came out and invited us to come in. About 25 staff were gathered inside the front entrance to greet us. It was as international a group as you can imagine, mostly young. We were shown to a table in the rustic, rough-hewn dining room. And the show began. The meal and (very unusual) wine pairings will be described in the next two posts, followed by the tour of the restaurant, kitchen, the lab, and the staff room in the final installment over the next few days.